Are you getting ready to have an event outdoors? Do you have a lot of parties in your backyard or do a lot of tailgating? Would you like something that can keep you and your whole family protected from the harsh rays of the sun when you’re outside? With the Pro Shade Instant Canopy 10x10 tent, you can do all that and a lot more, too! This canopy tent is designed to protect you and several other people comfortably, whether you’re spending time watching sports from the sidelines or you’re going to be in your backyard partying with your family all day long. If you’re interested in bringing home a product like this for your needs, be sure to check out our review below to see if it’s the right option for you. And keep in mind that the Pro Shade company is committed to providing customers high-quality and long-lasting shade products that will do their job well while looking great, too. This company cares about its customers and uses durable materials in the construction of its canopies so you never have to worry about whether or not your tent will hold up to one more use. It can be challenging to find a canopy tent that will suit your needs well and won’t be damaged too easily. But if you’re looking for something simple but very useful, you can’t go wrong with picking up a product from the Pro Shade company. To learn more about their 10x10 canopy tent, read on. 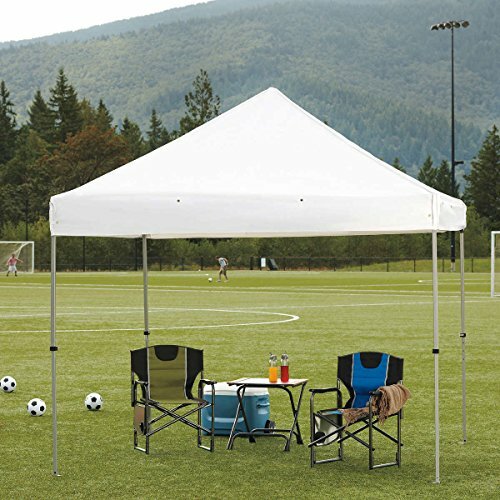 The Pro Shade Instant Canopy 10x10 tent is a heavy-duty canopy made from durable, thick polyester fabric that is designed to be resistant to UV rays. It comes with a sturdy aluminum frame that’s long-lasting but lightweight enough that it isn’t challenging to put up or take down when the time comes. The canopy also includes its own rolling carry bag and a set of stakes as well as the hardware needed to hang additional sidewalls if needed. This canopy is a 10x10 square that provides plenty of space underneath for at least two chairs and a table, if not more. This canopy is a straight-leg design that’s easy to pop up and down as needed and even easier to move around if necessary. The tent can be staked down with no trouble using the included stakes, or you can use some guide ropes (not included) to tie it down even more securely so it won’t tip over or blow away in the wind during longer term use. ​We like the lightweight nature of this canopy. When it’s set up, if you find that you need to adjust its location, all you have to do is take the stakes up and get a few people to help you simply pick it up and move it to a better location. And when it’s time to set it up or take it back down again, the pieces are light enough that you should have no trouble doing this own your own or with the help of another capable adult. We feel that the biggest flaw with this tent canopy is that it’s only available in white. Although white canopies are very useful and neutral enough to fit into just about situation, many people like to use these tents for tailgating purposes. And if you’re a big fan of your favorite sports team, there’s a good chance you want to show your team spirit by choosing a product that showcases their colors, too. On the other hand, if you’re trying to use this canopy for a backyard event or party, you may be trying to match it to existing decor, but you’ll run into problems with only one color option. Multiple colors would be a great improvement. The canopy is resistant to tears and other types of damage related to wind and other weather elements. Even when used in the direct hot sunlight for a long time, the fabric on the canopy doesn’t wear out easily over time and will continue to be durable for a long time to come. There’s plenty of room even for a taller person to stand up comfortably underneath this canopy tent, and there’s also plenty of room for several people to spread out under it, too. The aluminum poles are resistant to rusting and breaking due to wind, too. It may be harder to take this tent down than it is to put it up, so make sure to get some help when doing so. The tent’s fabric may be challenging to keep clean, and if it gets stained you may not be able to remove the stain effectively. The tent doesn’t come with ropes or sandbags for securing it in place, and it only comes with stakes that may not be sturdy enough to get the job done if you’re using it in sand. In rare situations, some customers say that the canopy may arrive missing some pieces or with some damage to the fabric or frame, although this is not likely. As you can see, there’s a lot to keep in mind when you’re thinking about bringing home a Pro Shade 10x10 canopy tent! This product is high-quality and durable enough to become an instant hit whether you’re entertaining in your backyard or looking for something to bring along with you for your next camping trip. No matter how you choose to use your new canopy tent, you’re sure to love the way it can keep you cool and shaded without being too challenging to set up or take down. This is a great option for small and large families alike! But does it really live up to its commitment to customer satisfaction? For the most part, it does. This product is simple but very sturdy and it’s made out of materials that will last for a long time to come. All in all, if you’re looking for something to be a perennial part of your summer time fun, this canopy is a great option for you. Remember to stock up on some extra removable sidewalls if you’re looking for something a little bit more sheltered, and don’t forget to grab one wall that can work as a door if you need something that can be fully enclosed while you’re in it, too. This is a great multi-purpose canopy tent, so don’t be afraid to get a little creative with how you use it!